16 mm in diameter. Tensile strength is 136 kg, shear 170 kg. With a M5-thread, these V4A studs are ideal for mounting wire clamps and securing items which require a smaller stud diameter. The substrate determines the adhesive. This is a structural part with 225 kg of tensile strength and 295 kg in shear. Maximum torque load is 6.7 Nm. 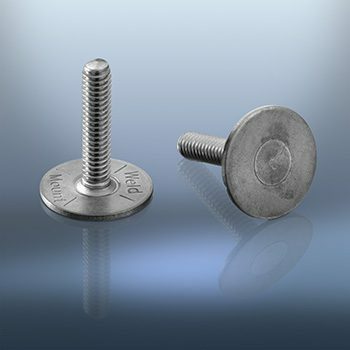 Please note that all of our studs can be bonded from either surface of the base plate. 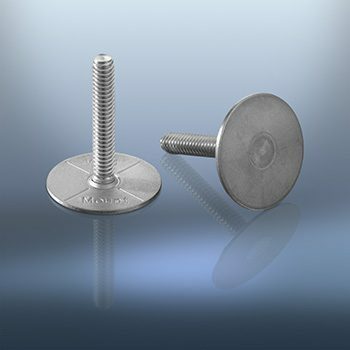 Our V4A stainless steel studs mount to virtually any surface using our adhesives. The substrate determines the proper adhesive. This is a structural part with 225 kg of tensile strength and 295 kg in shear. Torque load is 10 Nm. Note that these studs can be bonded on the under or upper side of the base. Used for hanging panels, insulation, battery chargers, cabinets, through deck mounts, upholstery bolsters and many other uses. 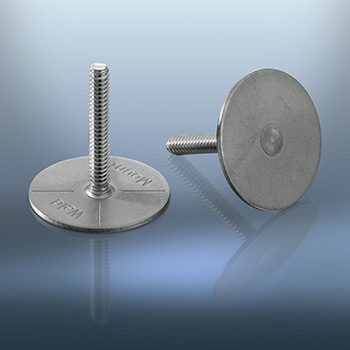 Our HS50 stud is designed for heavy load applications such as mounting filters, panels and signs. The stud is inertial (friction) welded to the baseplate creating a very strong part. The base plate is 5 cm in diameter. 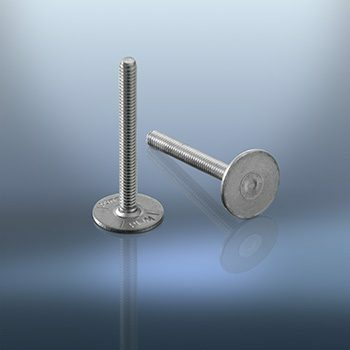 These studs are manufactured of V4A stainless steel. Tensile strength is 544 kg and shear strength is 680 kg. The substrate and application determine the adhesive.